Pastern dermatitis goes by many names. It is a frustrating condition for both horses and their owners. If the horse is touchy in the affected area, sedation may be the only way to get close. The sight of a horse owner pulling their hair out during the wetter months is a sure sign that things are not going their way. With plenty or rain and mud about, there’s a good chance they are locked in a battle with an infuriating condition commonly called mud rash. The condition goes under a lot of other names: scratches, mud fever, greasy heel, cracked heels and dew poisoning, to name a few. Your vet is most likely to call it pastern dermatitis. Many factors can contribute to a case of pastern dermatitis, which in part explains why many horse owners find some treatments to be slow or ineffective. Because several factors may be at play, a veterinarian is likely to refer to the condition as a syndrome. The term pastern dermatitis is therefore a clinical description rather than an actual diagnosis. That is all of little comfort to a horse owner, who would rather find an effective treatment and move on. Pastern dermatitis, as the name implies, affects the skin of the lower leg of the horse. It is most common on the back legs and tends to affect horses with feathers more. It tends to be most common in lighter, non-pigmented areas. Pastern dermatitis usually starts at the heel and progresses around the sides of the pastern before extending up the leg, occasionally going as far as the knee. 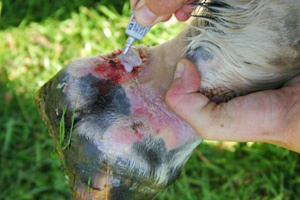 The skin around the coronet, pastern and heels becomes inflamed, scabby and ulcerated. It can ooze fluid and the skin may eventually crack. The first signs are often matted hair with dry crusts. It will often progress to moist, weeping lesions. Beneath the crusty top layer you are likely to see red or pink sores and possibly pus. Rain scald or rain rot on the back. In more extreme cases, the condition will result in considerable leg swelling and may cause the horse to go lame. The same condition can also cause similar lesions on the upper body, which most horse owners call rain scald or rain rot. It is most often found around a horse’s back and neck. At times, it is possible to see a pattern which follows the way rain has run off the animal’s coat. The lesions look similar to those of mud rush. A few years ago, the blame was put fairly at the door of one soil-dwelling bacterium called Dermatophilus congolensis, Today, research shows that pastern dermatitis can be caused by several different bacteria. Even some fungi – notably that which causes ringworm – have been shown to play a part. Mites, especially Chorioptes, can also be a cause. Needless to say, having multiple foes does not make control any easier. The different bacteria can leave a slightly different signature. Dermatophilus congolensis, for example, causes relatively little discharge and relatively little in the way of scab formation. Your horse is likely to be more comfortable in allowing you to touch and treat the condition. To begin treatment, the area must be cleaned … … and clipped. Pastern dermatitis caused by Staphylococci or Streptococci will normally result in more discharge, more inflammation and more pain. Your horse is likely to be most unhappy about you handling the affected area. These bacterial bad boys on the block are the equivalent of your local thugs hanging out on a street corner – or in this case a paddock – just waiting to pick off an easy victim. Vets talk about pastern dermatitis in terms of a syndrome because several potential underlying factors can have a bearing on its nature, its severity, and responsiveness to treatment. In some cases, pastern dermatitis may be part of a wider systemic problem that affects skin or even the internal organs such as the liver. These factors will likely play a part in determining whether a horse has a mild form – hair loss, dry and scaly skin and crusty sores – or a more serious manifestation, with redness and swelling of the skin, more serious crusting and pus-filled sores with damaging inflammation of the blood vessels. The pus discharge or clear yellow fluid, called serous exudation, from these sores can give the surrounding hair a greasy appearance – hence the name greasy heel. At its worst, fissures can open in the skin and thick, fibrous, granular scar tissue can begin to form. Most of the factors that allow bacteria to get hold in the pastern area are well-known to horse owners. Legs that are persistently wet or muddy are prone to the condition. Outbreaks are thus most likely to occur in winter, especially so during wet conditions. A wet environment softens the skin and makes it more prone to damage. Combined with winter mud, a whole bunch of bacteria will have little trouble in treating even the slightest bit of skin damage as an open invitation. After washing with a suitable antiseptic solution, the scabs will be soft enough to be gently picked off. Horses that are turned out at pasture 24 hours a day are most prone.It can spread from one horse to another, so an owner’s best strategy is to keep the condition at bay. A sensible strategy is to get horses at pasture in regularly during damper weather to ensure that their lower legs dry out thoroughly. When thoroughly dry, give them a brisk brush to remove any dried mud. Take the opportunity to check the lower legs carefully for any signs of the condition, as early treatment will hopefully deliver a speedier resolution. Leaving treatment too late can mean weeks of work in getting the upper hand. If the condition is not responding to treatment within a few days, or it continues to spread or is painful to the horse, then contact your vet. Calling a vet in more serious cases not only gives you the best chance of getting on top of the problem, but they come armed with sedatives. Sedation will not only reduce the risk of being injured if the horse kicks out while the scabs are being removed, it also means a more thorough clean-up and assessment can be undertaken. To remove the cause of the problem. To stop the spread of the condition. To treat the skin damage. At a basic level, the horse is suffering from pastern dermatitis because bacteria have found conditions to their liking. It only makes sense that if you can create conditions unsuited to the bacteria, the condition will improve. Once the area is clean and dry, you need to apply a cream or solution formulated to kill the bacteria. Half-hearted measures are unlikely to bring about any improvement. The condition is unlikely to get better if you fail to control dampness in the area. If possible, house the horse in a clean and dry stable where you can prevent moisture affecting the area. There is much to be gained from carefully clipping the area right back. It will make it easier to deal with the sores and will help keep the area dry – or dry quicker if it does get wet. Repeated washings are generally not advised, unless that is part of the treatment with a tailor-made product recommended by the vet. Otherwise, once clipped, the affected areas should be given one good wash with a suitable antiseptic solution made with warm water. This warm washing should soften the scabs and allow them to be gently picked off. When done, dry the area thoroughly. Gently dab the area dry. Don’t rub. Never forget that pastern dermatitis can be painful and irritating to a horse. If your horse is reacting badly to your attention, called a vet and arrange for sedation. If your horse is accepting of your handling the area, another possibility is removing the scabs a few at a time over a period of days. Once the affected area is clean and dry, you need to apply a cream or solution formulated to kill the bacteria. A veterinarian will be able to recommend a suitable product, some of which also double as a moisture barrier. Such treatment may be needed for days on end. It is essential to keep moisture at bay. Some horse owners apply oil-based creams as a barrier against moisture. Vaseline is commonly used while others opt for vegetable oil or even baby oil, although some horses do have a mild allergic skin reaction to the latter. There are a number of off-the-shelf products designed for the purpose. Don’t be put off if they appear thick and oily – that’s all part of the trick in keeping the moisture out. Some horse owners have had success in protecting the heels and pasterns with special boots or bandages. Care needs to be taken to ensure the boots or bandages don’t rub and cause even more damage. Depending on the severity of the case, a vet may want to see the animal. Vets will not always take the same approach. Topical antiseptics, antibiotic creams and steroid creams all have their place, depending on the cause. Antibiotics by mouth or injection are another option in more severe cases and corticosteroids can be prescribed. Anti-fungal agents may be prescribed if fungi is identified as a cause. Pastern dermatitis most commonly affects lighter, non-pigmented areas on the horse’s lower legs. The condition should begin to improve, although not necessary rapidly. If you’re not satisfied with progress, contact your veterinarian again. Slow improvement may persuade a vet to opt for antibiotics by injection or mouth. Don’t drop your guard as the condition begins to improve. The area needs to be kept dry and moisture barrier creams will continue to help in this regard. It’s a pretty safe bet that any horse that has suffered pastern dermatitis will be prone to further outbreaks. Keeping the legs as clean and dry as possible will reduce the chances, and regular checks will allow you to tackle the condition at the first signs. There is no doubt that some horses are more prone to mud fever than others. It may simply be that some horses have better immune systems. However, there is also evidence that there may be genetic factors at play. While feathered horses are more prone, there is also evidence suggesting that horses with a denser coat around their pastern area may be less likely to be affected, possibly because the thicker coat provides greater protection. Many of these mechanisms and how they factor into pastern dermatitis are not fully understood. The complicating factor with pastern dermatitis centres on a number of other conditions that can contribute to the problem. The most common one is photosensitivity. White extremities are more prone to pastern dermatitis. It’s a pretty safe bet that if the pastern dermatitis affects only the white areas and is non-existent on adjacent dark areas, photosensitivity is involved. Photosensitive reactions in horses are most likely to occur in the extremities or around the muzzle. The most common trigger is exposure to red clover in pastures. The ingestion of the material can trigger the horse’s body to produce a photosensitising agent which triggers the skin reaction in the presence of ultraviolet light. Other known triggers are St John’s Wort, perennial ryegrass and buck wheat. Photosensitivity can also be a sign of liver disease, and is an issue best discussed with a veterinarian. A vet may well order a blood test for liver function to rule out this possibility. Some horse owners have had success with leg boots where photosensitivity continues to be a problem. There are other conditions that can produce symptoms that you may mistake for a common case of pastern dermatitis, among them being chronic progressive lymphedema and pastern leukocytoclastic vasculitis. Diagnosis is not always easy. The latter, for example, is poorly understood and may often only be diagnosed when all other treatment options have failed. So how is a vet likely to tackle a bad case of pastern dermatitis? The vet is likely to want to know the history of the animal. Has it had pastern dermatitis before? How severe has it been? Does the condition appear to be seasonal? If there is evidence of photosensitivity? The pasture it has been grazing will be of interest. The vet may take a blood sample to test for liver function where photosensitivity is present. A vet may well want to check out the animal’s bedding (dirty, too coarse or too wet? ), pasture (too much red clover or ryegrass? ), the prevalence of bacteria-carrying mud, or sandy soil (which can trigger skin irritation). The vet may choose to take samples to help with diagnosis. Skin scrapings can be checked for the presence of mites. Samples, including the exudate, may also be tested in a bid to identify the bacteria responsible, or the presence of fungi spores. Samples tested early in a case can often yield better results in terms of identifying the primary cause, as other bacteria can invite themselves to the party as the skin damage progresses. Staphylococcus, for example, is a common secondary bacterial infection in pastern dermatitis. Testing will obviously add to the cost of treatment, but the best way of getting on top of pastern dermatitis is to identify and treat the underlying cause. It may ultimately prove more cost effective than applying lotions or medications that aren’t doing the job. Once your horses are clear of the problem, you want to keep them that way. Don’t be tempted to turn a blind eye to minor cases, as the potential to infect others remain. It’s also a convenient way for the infective agents to “carry over” when conditions are less to their liking, only to come again when wetter or muddier conditions prevail. A Norwegian company has over a period of 6 years evolved and tested a new formidla avsnitt mudfever and oter skinconditions. It’s called bio power protection and consists purely of natural ingredients. I used this for my friesian in october, and within two weeks all four legs wich vere all heavely attacked vere in perfect shape! I know this posting is late, but my horse has this issue every summer. I am proactive now and apply Destin as soon as the rainy season begins in the summer which seems to do the trick.